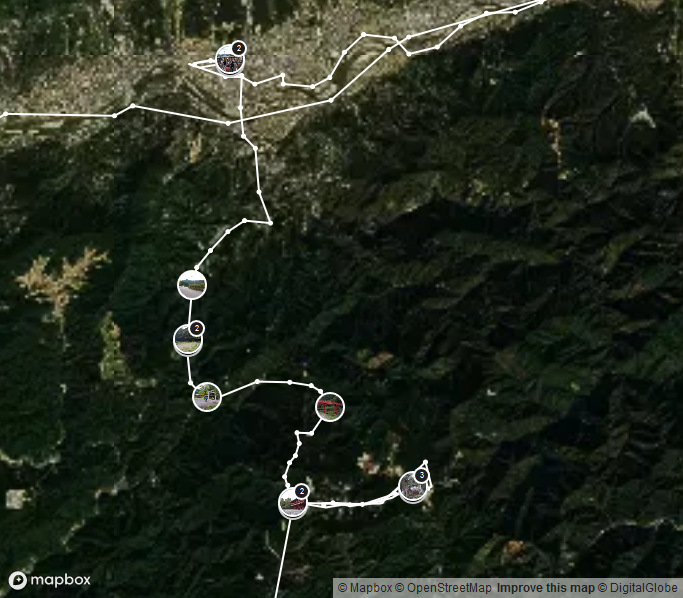 Part of our route today will be the same that we have done yesterday, therefore we are looking for alternatives. 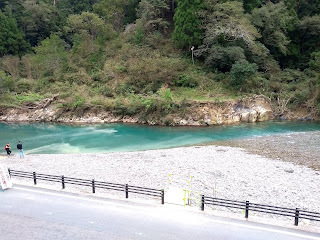 We have seen that there is another road on the other side of the river, and we ask to the owner of the hotel about it. He tells us that route 740 is not a nice road, being too narrow when compared to route 168, but that is music for our ears: it means that there will be less or no cars! Finished our breakfast we greet the hotel owner and his family and we set in motion: the air is chilly and the road goes downhill, and as much as possible we want to be on the main road before the traffic of the morning. Indeed, apart some bus full of students going to school, we meet no annoyance on the road until the point we can cross the river and reach route 740. 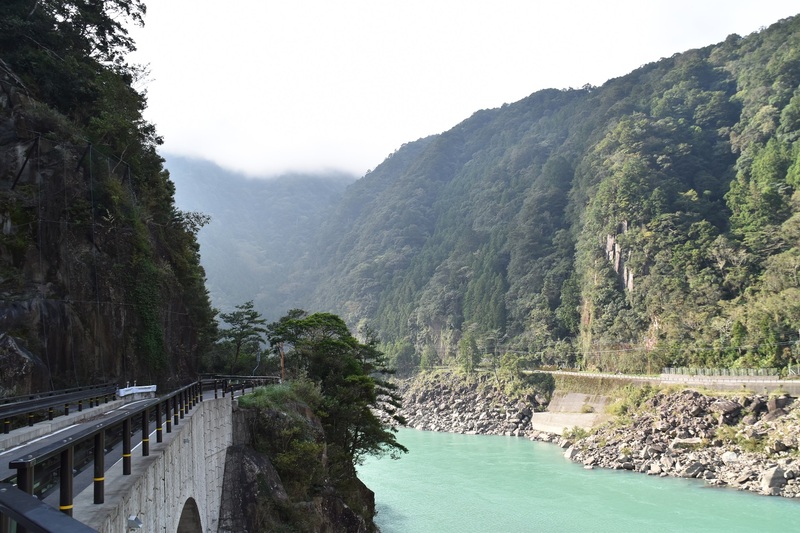 Indeed it is really narrow: if we should meet a car, we would have to step down and stay on the side to let it pass, but there is no sign of people using it, and moreover it is also being serviced, so we are confident we will be alone for a while. 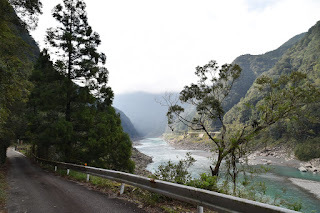 For a good while the road moves across the trees, letting us see the river on our right just for few moments, but then it opens up and allow us to enjoy the mist covered valley where the river flows. Often we see small waterfalls, either on our side or on the opposite side of the river, which give a fantastic vibe to the place. The frequent pauses to take pictures allow also the sun to rise and shine some more light into the valley, increasing our delight. 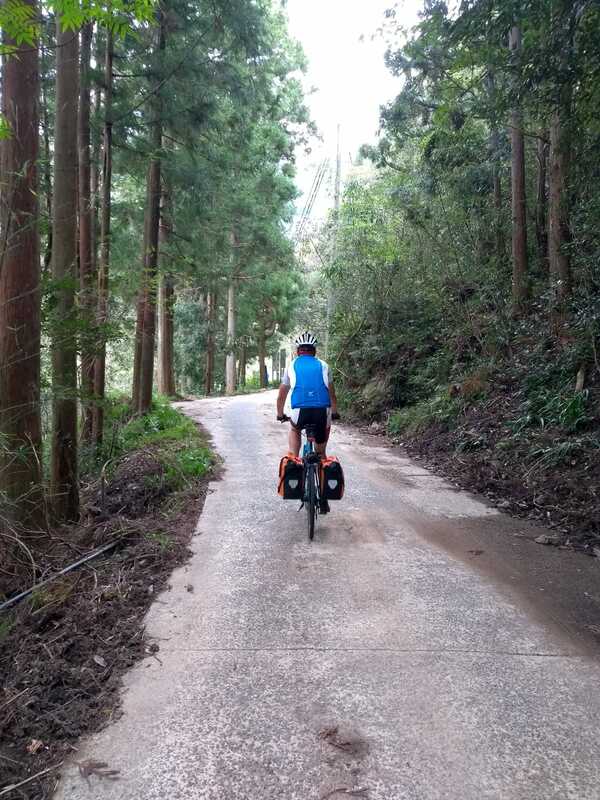 This narrow road is a true blessing, and cycling on it is really funny: aside from the gorgeous scenery given by the forest and the river, it has constant ups, downs and turns which keep the eyes and the body alert and active. At a certain point the forest opens up and we notice a flat area on the left, with what looks like a wooden building and a parking area. When we get closer we are welcomed by the magnificent Hisetsuno fall, rumbling down from a cliff. The wooden building is a camping ground with shop and barbecue, which, considering the early time, is of course empty. 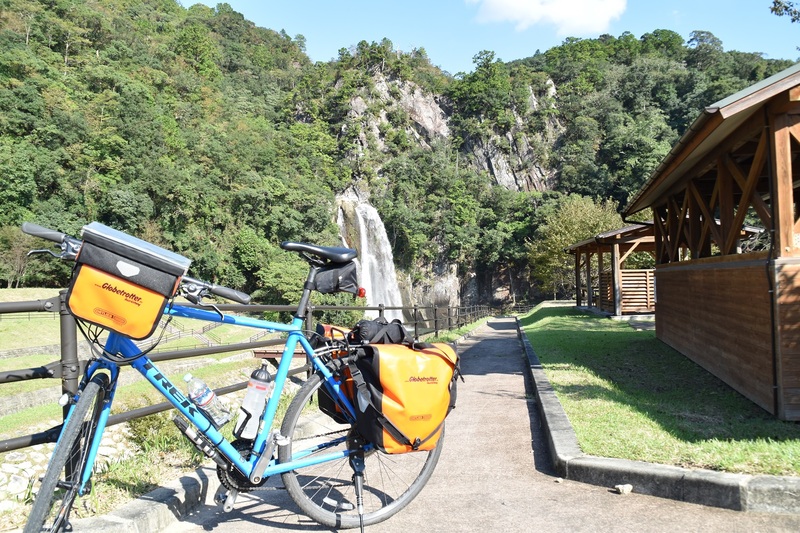 But for us it is fantastic: we park our bikes and take some pictures, enjoying the sun warming our bodies and the sound of the waterfall in the distance. 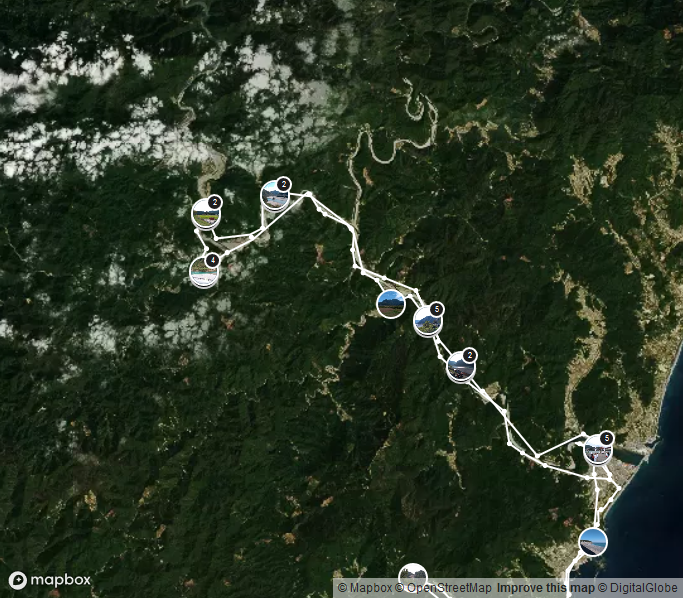 After the break we cross a small village and after it we see the island where the matsuri was held the other day: we are in Shingu, and from there we quickly reach the coast, from where, on a known road, we reach Nachi. Along the way a fisherman we meet in Miwasaki seems quite amused by the sight of two foreign cyclists. The same impression seems to have an elementary school class, which we meet while withdrawing some cash from the post office. We stop for lunch in the sunny bay of Ugui, where we find a nice beach with benches right in front of the sea. 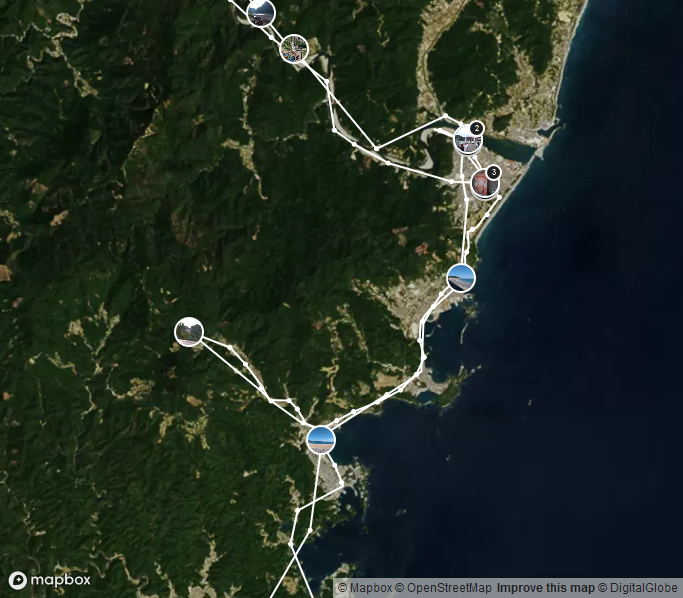 From there we continue until we reach Nachikatsuura and its fish market. The main market is closed, but the tuna we see on sale in a supermarket looks really tasty. 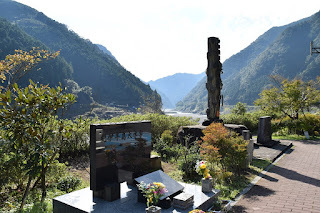 When we reach Koza we have still some time before sunset, so we decide to go inland to visit the pitted rocks of Kozagawa before reaching our lodging. 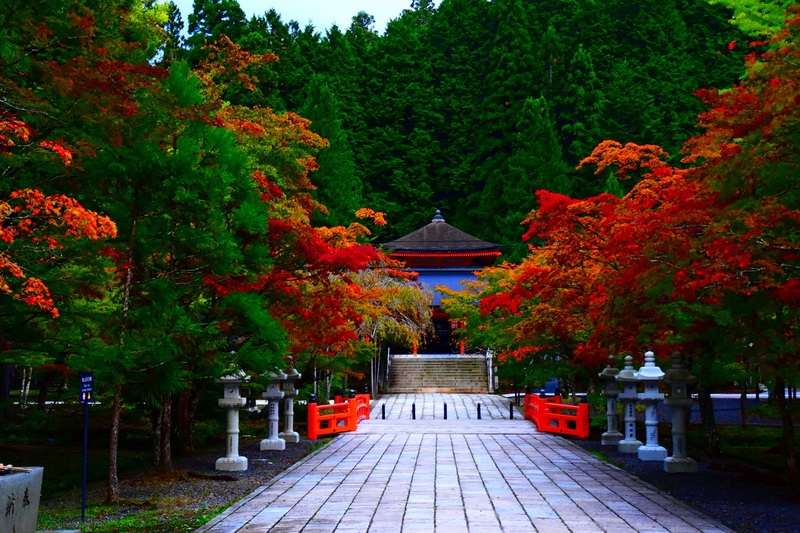 The place is called Yamasakiya and is run by an energy full old lady, with a strong passion for cooking. Despite not having requested the dinner, she offers us some samples of her skills. We are delighted by the delicious food she prepares, but also regret not having the full dinner there. The room upstairs is really big, and while we relax in it, we hear someone singing close-by. When we give a look outside, we see that in the building opposite from our room, an old school, a choir is practicing. Their voices are the only human sound which we hear in the otherwise sleepy town. After a good night of sleep we are welcomed in the kitchen by Seiko-san and the breakfast she has prepared for us. She insists that we eat plenty of food, since we have to bike the entire day, and who are we to disappoint her? It's really a pleasure to have some chat in the morning, and Seiko-san is a really good host. Before departing we take some pictures together and then the two of us hit the road on our bikes. Being early in the morning there is not so much traffic, and we manage to exit the town with not that much effort. 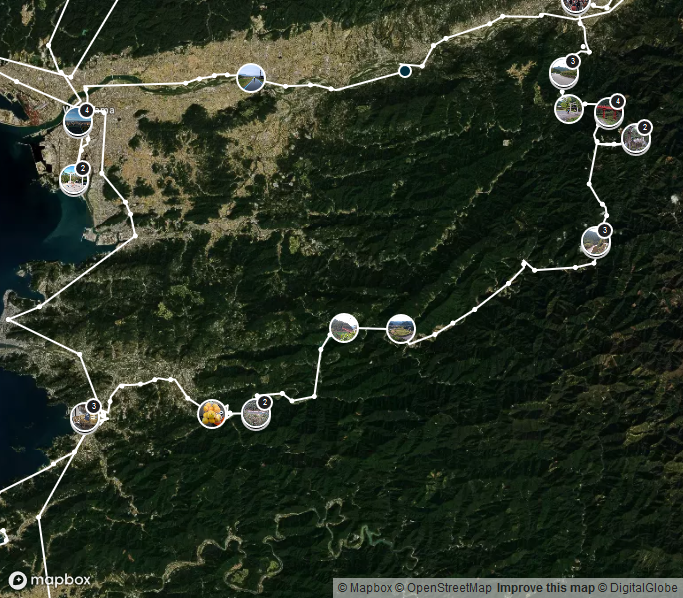 Then the highway 311 starts climbing following the Kumano river, with just trees all around us. 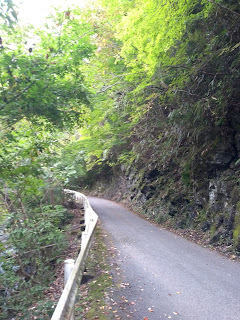 The temperature is chilly due to the lack of direct sunlight, but pedaling uphill makes it pleasant. After few kilometers of steady progress we get a small inconvenient: a flat tire! Luckily we are close to a lay-by, and we can stay off the road while fixing it. 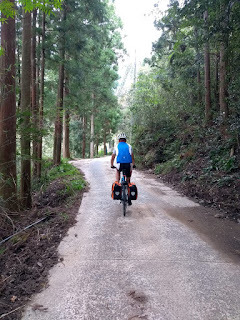 While replacing the inner tube the frequent moments in which no car is driving by let us enjoy the quiet of the forest: walking these mountains must be a real pleasure. Fixed the tire we resume our climb, and some more kilometers uphill we find, on our right, a rest station, where we stop to take some picture and buy some drink. Down in the river we see people doing rafting, while enjoying the sun on the benches together with us there are many who are either walking up the mountains or getting there by car. Further uphill we see on our left side some waterfalls, but we have no safe space to stop our bikes and take some picture, and we just savor them with our eyes. In the blue sky several eagles fly around, searching for their prey. 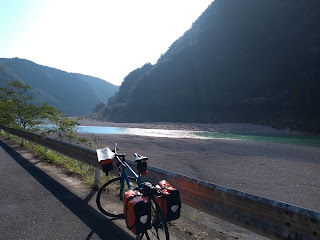 Before the electric power plant in Shikiya we have to exit the highway to avoid a long tunnel forbidden to bikes, and since we are there we also cross the bridge to reach the other side, which looks like more pleasant. Our intuition is indeed correct, and we bike on a deserted road until we are forced to cross back on the main road, just before entering Hongu. There we reach the bus station to lock our bikes and, after having eaten something, visit the city. 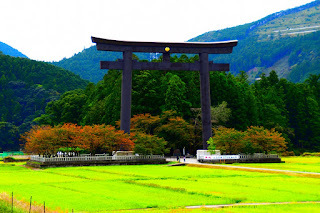 First we walk to the huge Otorii leading to the Oyunohara: torii are usually impressive on their own, but this one, with his enormous size is definitely in another league, and seems really asking for respect to anyone walking under it. 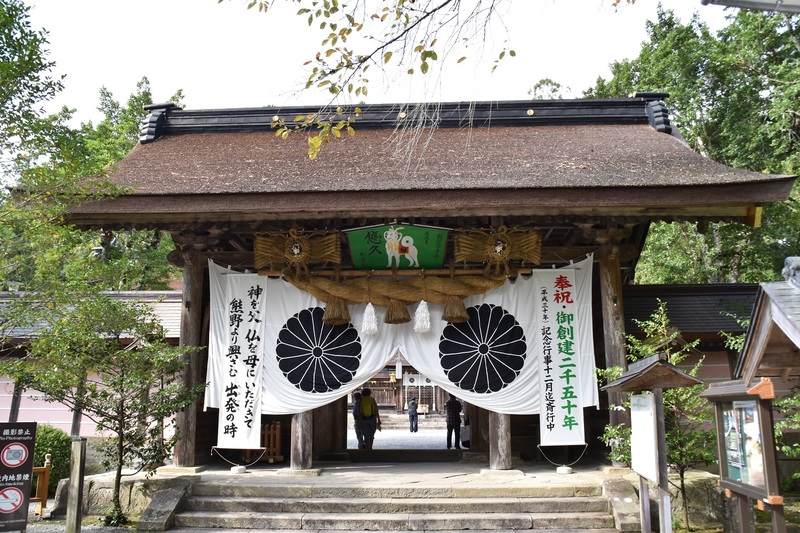 The inside of the shrine is quite and, surprisingly, not crowded at all: just few people praying, and a quiet atmosphere. Close to the shrine we spot again the French crew we meet before reaching Asuka few days ago. Also here they are busy filming the rice fields. Returning from there we climb the stairs leading to the Kumano Hongu Taisha shrine, and here we see that there are more people, but definitely absorbed in spiritual activities. Some of them also consult the oracle and its future telling sticks, searching for a good omen. 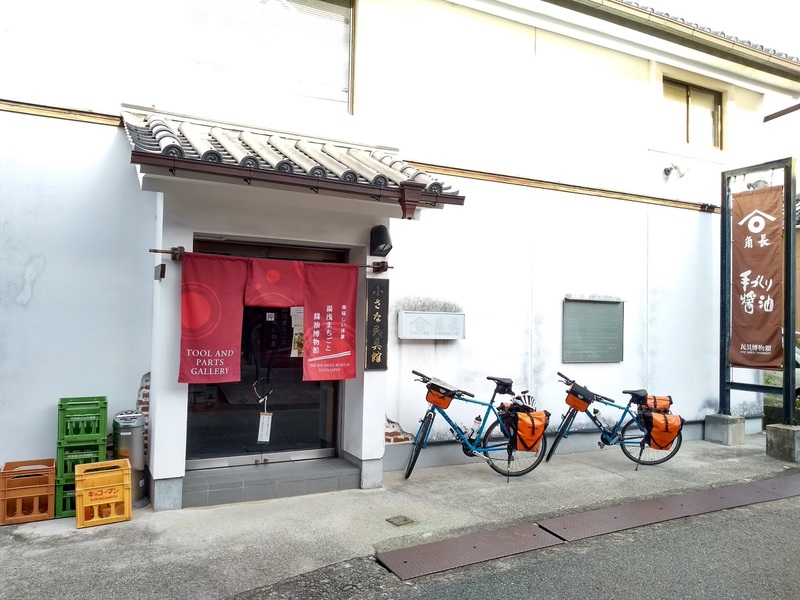 We get back to our bikes and, before setting in motion again, we do a quick check to confirm that there are no open restaurants for dinner in town, so we will have dinner at our hotel. 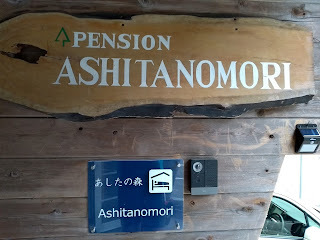 Then we move on to reach Ashita no mori. The place is built in a small village next to the Oto river, and when we arrive it gives mixed feelings: some buildings are obviously inhabited, but some others look like they are about to collapse. 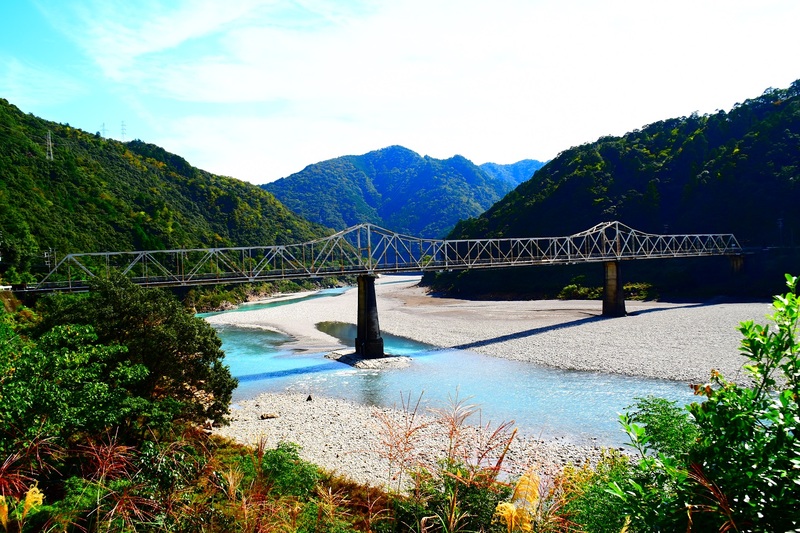 Upon checking in we learn that what we have seen is the result of the typhoon: the swollen river has flooded some of the houses, and those which were not built higher than the road level have suffered large damages. 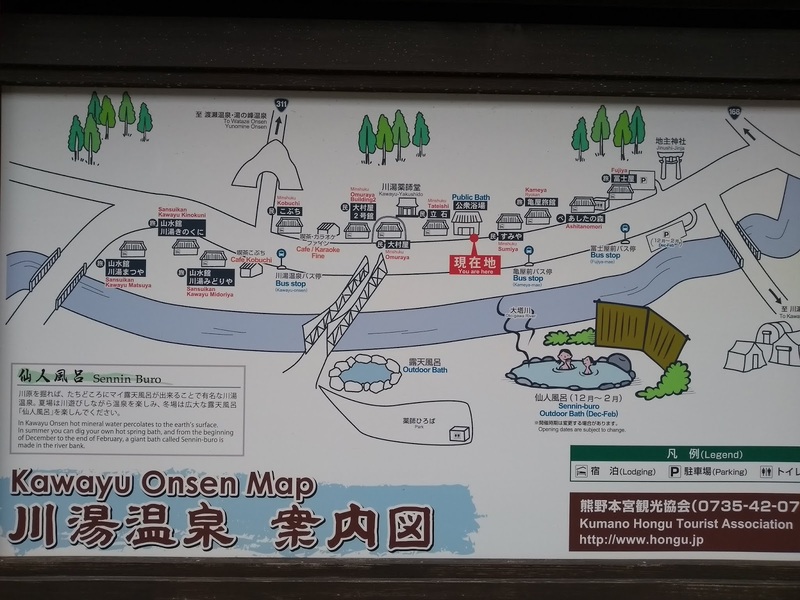 The owner explain us that we can use the outdoor onsen, bathing in the river, or use the indoor one, using the same spring. 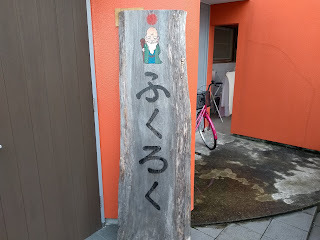 When we opt for the indoor onsen we are just warned that the water is really hot, so it is not advisable to jump in it, but rather slowly enter it to get used. And I must say the water is really hot: at first I can barely enter it until my calf and I have to get out, then above the knees and get out again, then to my belly and out again, and only at the end I can manage to sit into the pool with just my head pocking out. 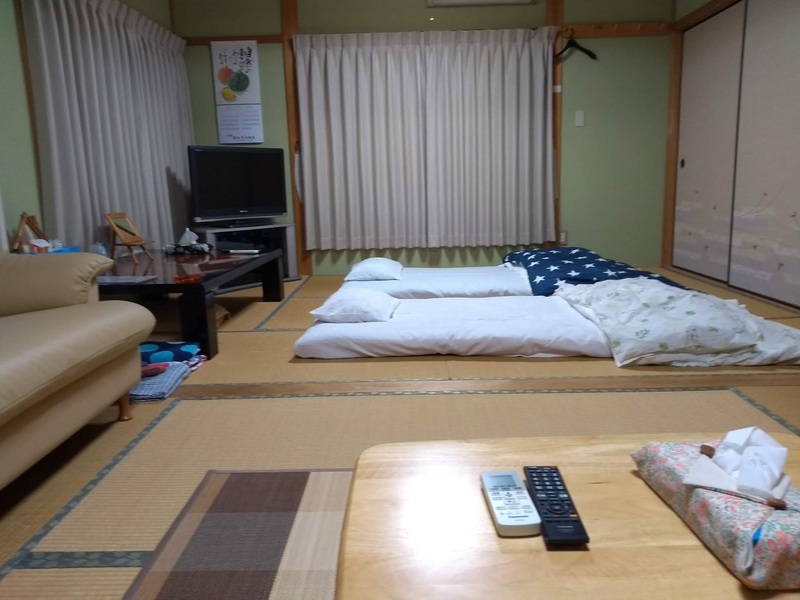 But then I can fully relax and soak my body into the onsen. 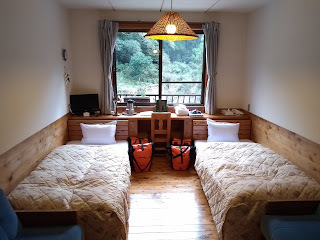 After the visit to the onsen we leave our panniers in our room: its interior is fully wooden, and it is a pleasant variation after so many days of tatami. Also the outside of the building stands out, with its alpine look. When we get out for a stroll before dinner we see that some persons are bathing into the river, where it is clearly evident where the thermal water is springing out. Upstream a fisherman is laying his nets across the stream. We cross a small suspended bridge and reach an area from where it should be possible to reach the open air onsen, however the fallen trees cluttering the river bank advice us not to proceed further. 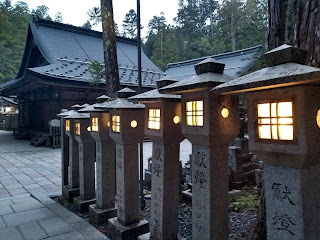 On the way back to the hotel we climb the stairs leading to a small shrine, where the divinity protecting Kawayu Onsen is enshrined. The murmuring waters of the river give a good feeling while we are here, and we enjoy the darkness falling on this remote place, before heading to the hotel for our dinner. There we meet an old man, evidently the father of the person who welcomed us, as we can say from their close resemblance. He thanks us with a gentle smile for staying at their hotel, and gifts us two origami made from his wife. Later we will discover that this very old man has a rich story behind: he left his job in the city and came back to the village where he was born to become a sort of guardian of the forest, taking care of the trees and trying to revive the local community. 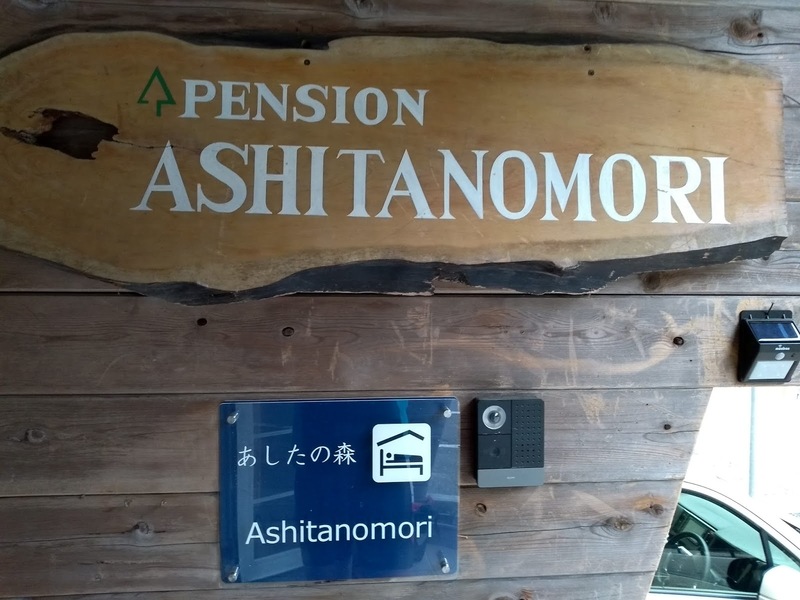 When we learn about this, all of a sudden the name of the hotel makes perfectly sense: Ashita no mori means "the forest of tomorrow". You can see his full story in the following video. When we retire in our room we can clearly hear, through our windows, the river flowing nearby. Its gentle voice cuddle us in a restoring sleep. 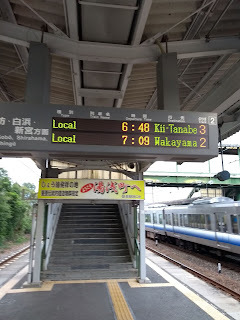 Our schedule today is rather different than the previous days: first of all, it's the birthday of my travel mate, and also we wake up earlier than usual (which is already early on its own) because we want to catch the train for Nachi. From there we will reach Shingu, hopefully in time to assist to the Mifune matsuri at the Kumano Hayatama Taisha Shrine. Then we will then cycle back to Wakayama along the coast in the coming days. 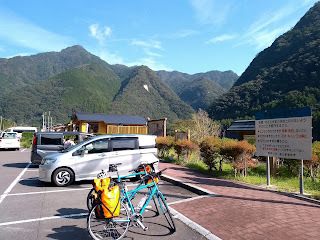 After leaving the hotel at sunrise we reach the station, where we quickly wrap the bikes in the rinku bags and go to the platform waiting for our train. At this early time in the morning we are the only two travelers to not be either students or workers, and is to be expected that we attract the discreet curiosity of all the other passengers. 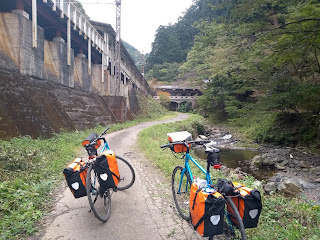 When we board the train we manage to put our bikes and panniers in a way that causes the least trouble to the other passengers, and then stand until Kii-Tanabe. From there we are 2 of the remaining 6 passengers on the train, and we can seat and enjoy the panorama while the train travels. It's a good opportunity for us to get a glimpse of what we will be visiting few days ahead, and we must admit it looks really promising: bays and rocks, crystal blue waters every time the train travels along the coast. 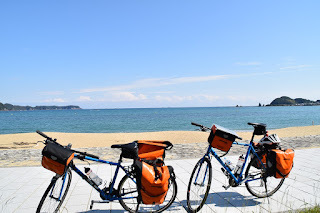 With those pleasant sights in our eyes we quickly reach our destination and step down the train, but before we have to assure the train staff that we are at the correct station: we had a ticket for two stops ahead, but we have realized that it is pointless to cycle back. 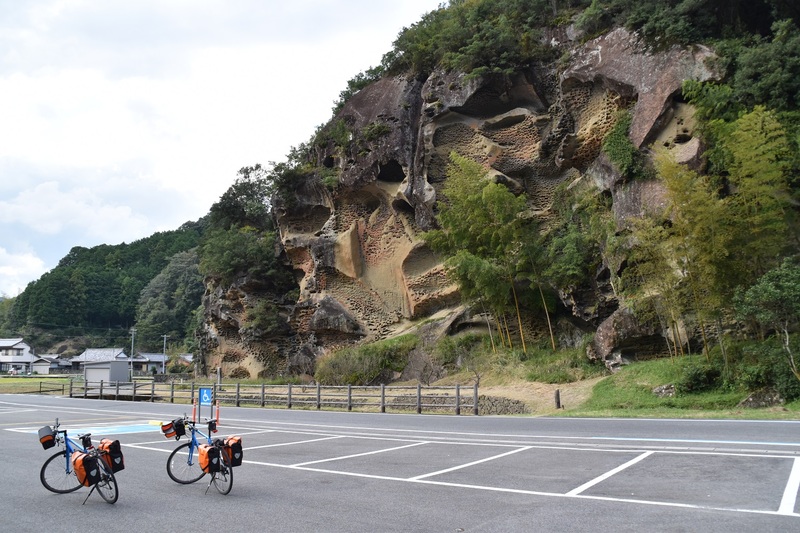 Mounted back the bikes in the deserted station, we are ready to climb to the Nachi falls. The road goes parallel to the river, but for most of the route its waters are muddy: upstream they are working on the river bed, and this affects the water downstream. 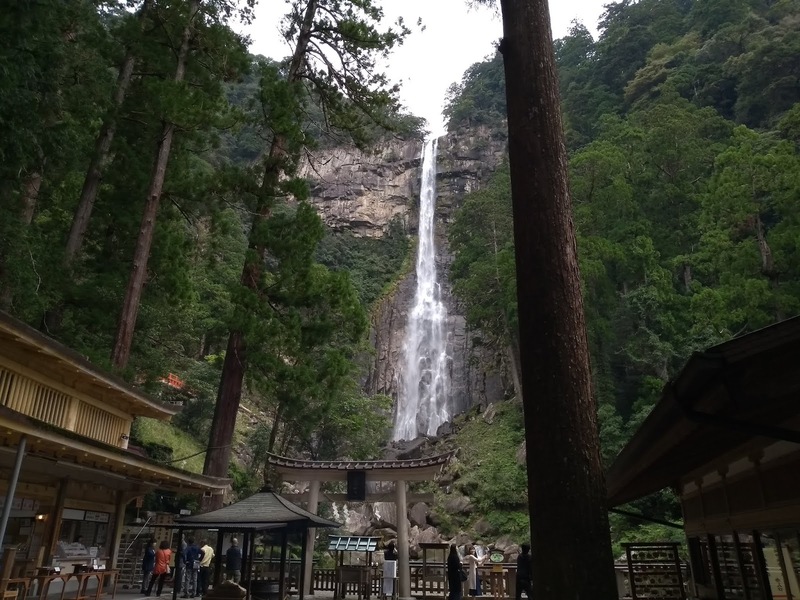 The surrounding are however enjoyable: the more up we go, the more the houses leave space to the forest, and when we reach the 5 headpins before the falls we have just trees around us. The view of the waterfall helps us focus on the climb, and the steady succession of curves gives us short term goals to maintain a good climb rate. When we reach the observation point we are breathless, both for the view and for the effort! 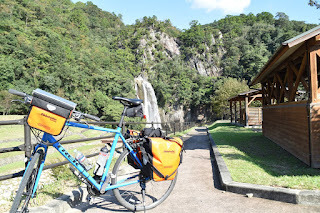 We secure our bikes with the locks and descend the stone stairs to reach the temple at the base of the waterfall. The view on the waterfall and the cliff from which it falls is, despite the cloudy sky, breathtaking. We take some pictures and then go back to our bikes to reach Shingu. 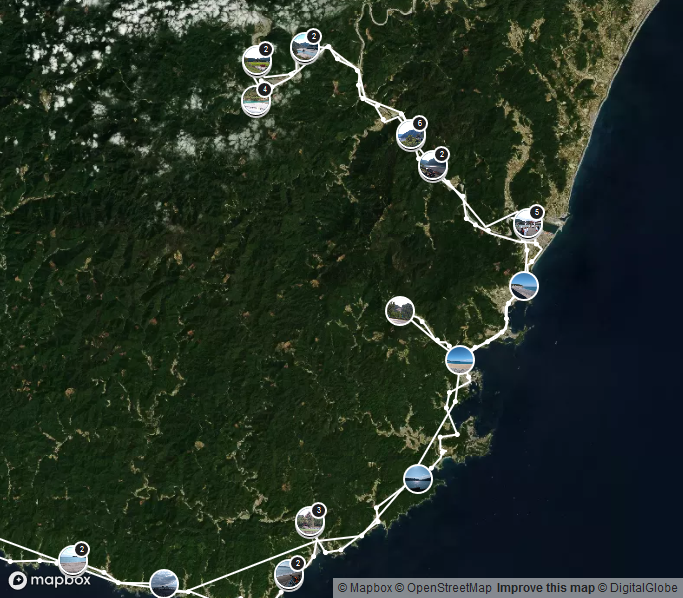 Getting back to Nachi takes a really short time, and from there we cycle along the coast. The nice thing of this part of the coast road is that it has recently built, 4 lanes tunnels to allow for the large road to go through the hills. The old, double or single lane tunnels however are still there and have been repurposed for pedestrian and cyclists. 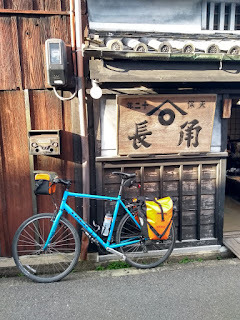 When we reach Fukuroku guesthouse in Shingu at about 2 p.m., Seiko-san the landlady is surprised to see us on two bikes: she was expecting us on two motorbikes! After getting a shower we start chatting with her, about our trip, our past experiences in Japan and also explain her that our plan is to visit the city and the matsuri. She listen to our stories and, thanks to a translator, we are able to pleasantly interact with each other. 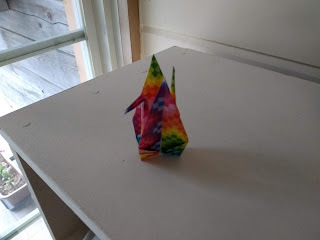 She is surprised about our bike trips in Japan, and among other things she tells us what are the places that can be visited in the city (way more than we can visit in half a day) and then she offers to guide us at the matsuri, since she has also decided to go there. 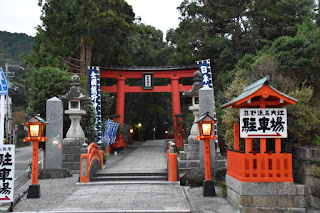 We gratefully accept her offer and go with her car to the temple, and once there she guides us into the precinct where, apart from showing us around, also introduces us to some of the crews who are about to join the matsuri. Then we move to the river bank, where the ceremony is about to start. 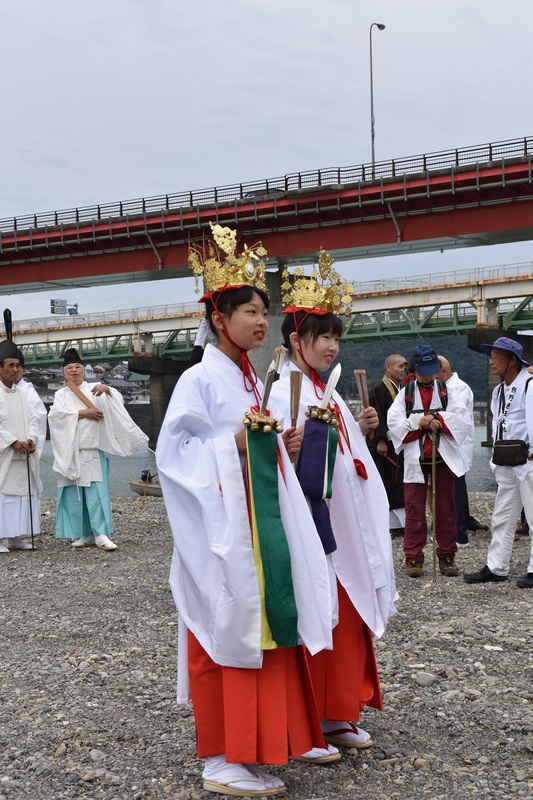 Once a year the deity enshrined in the temple is brought back on a small island in the middle of the river, and 9 crews compete on a rowing race for choosing the one of them which will take back the deity into the shrine. When we reach the river bank the crews are starting to warm up, and we get introduced to some more of the crew members by Seiko-san. She also tells us some stories about the matsuri (her father used to be one of the rower in the past) and also tells our story to all the people approaching and greeting her. We realize she is really popular in the city! During the warm up she also manages to find 3 seats on a boat to assist at the competition from very close, and offers us to join her. The offer is surely fantastic, way above what we were expecting to do today, but we are not exactly covered up for staying on a boat in the middle of a river with a chilly wind blowing on us from the mountains and, afraid of catching a cold, we have to decline it. 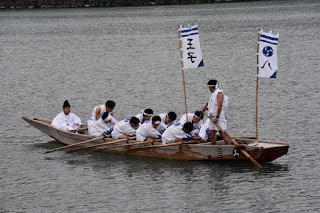 We assist then to the start of the competition: one member of each team has to run on the river bank, take a flag and take it to their boat which can then start rowing upstream and complete 3 laps around the island. Once the crews start rowing upstream the creaking sound of the stressed wood quickly fades into the distance, and to reach the meander where the island can be seen we follow the omikoshi being carried back to the shrine. 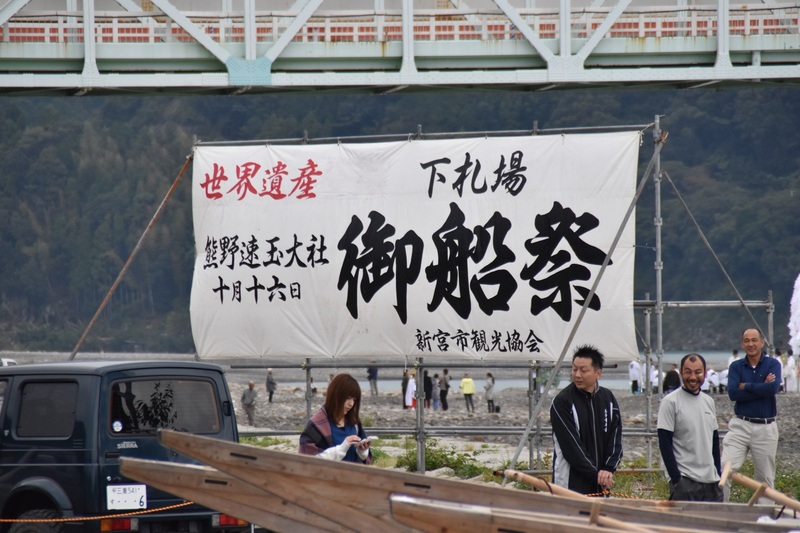 Both banks are crowded with spectators, and those of them coming close to us are proud to see two foreigners assisting at the their matsuri. 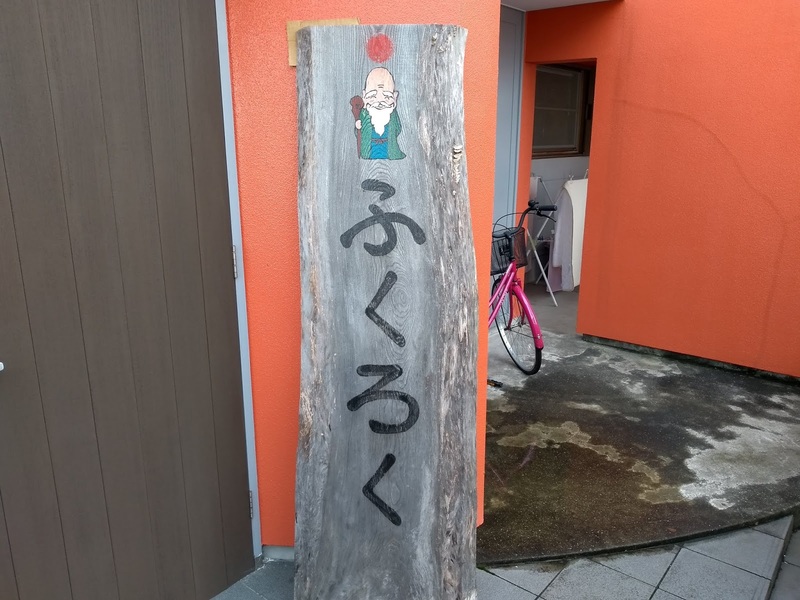 We have some small chat with them: someone has taken a day off and has come here from the distant city where they work just to be able to carry the omikoshi, and all of them appear very proud of keeping this tradition alive. Once finished the race we walk back to the guesthouse, and while on the way we meet again the landlady, who takes us on board of her car. 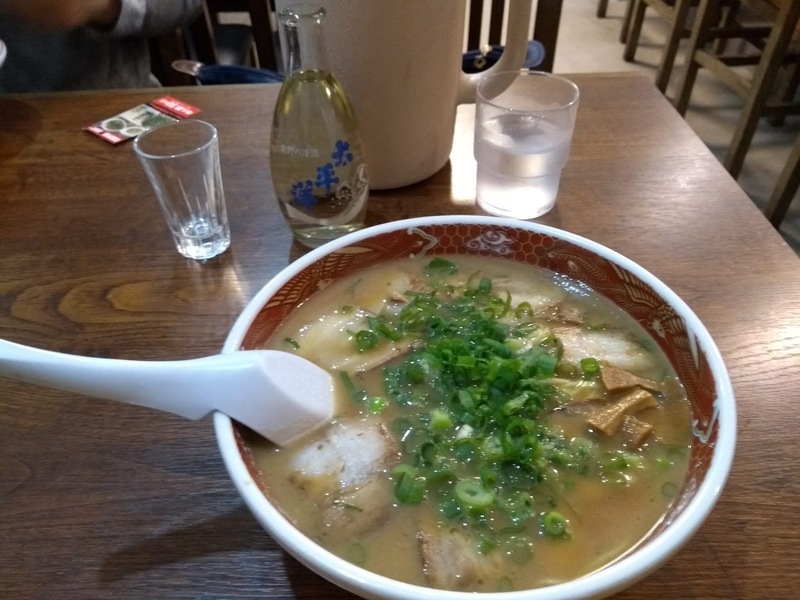 At home we ask her advice for where to have dinner, and she tells us that at short distance from her place there are several possibilities: an izakaya, an hamburger restaurant, a sushi restaurant and a ramen restaurant. We pick the last one and invite for dinner with us another guest who is staying there. The Wakayama style ramen we eat are really delicious, and having company while eating makes them taste even better. 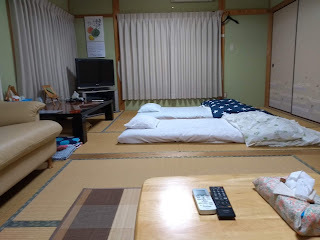 Once we return at the guesthouse we ask the landlady if she can help us reserving the lodging for tomorrow.We must say she has been really kind to us, and we wish we had planned to stay more time here. However that's not the case, but we are glad we have had the possibility to enjoy her hospitality. Thank you very much for your kindness, Seiko-san! Being on Koyasan means that most of the guests are either pilgrims or have something to do early in the morning, therefore for once we are not the only one to wake up with the sun rise. 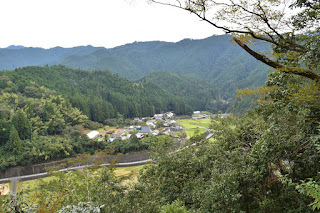 After greeting the staff of the guesthouse we cross the village to reach the Daimon gate and descend into the valley. The roads are not yet crowded with people and packed with cars, so we can enjoy the quietness of the recently awakened streets. From the Daimon gate the road goes steeply downhill among the trees, until we reach the bottom of the valley and notice a rather suspicious signal, written only in Japanese, on the direction we are taking. We climb for few hundred meters and we understand what the signal was telling: for a length of about 200 meters half of the road has collapsed down in the valley during the recent typhoon, and the road is closed to traffic. Some workers are busy repairing the entire section, and are quite surprised to see the two of us there. For a moment we are afraid that they won't let us pass and that we will have to take a long detour, but they just ask us to wait until the caterpillar has finished crossing the damaged section and then let us pass. While we are walking to the other side, and our eyes stare in the abyss beneath our feet, we mentally thank our decision to reach the ocean instead of crossing through the mountains: finding a closed road in the middle of nowhere would have been quite a bummer! The positive aspect of a closed road is that we have it entirely for us: nobody is using it, and we can roam it as we please while moving on the side of the cliffs. 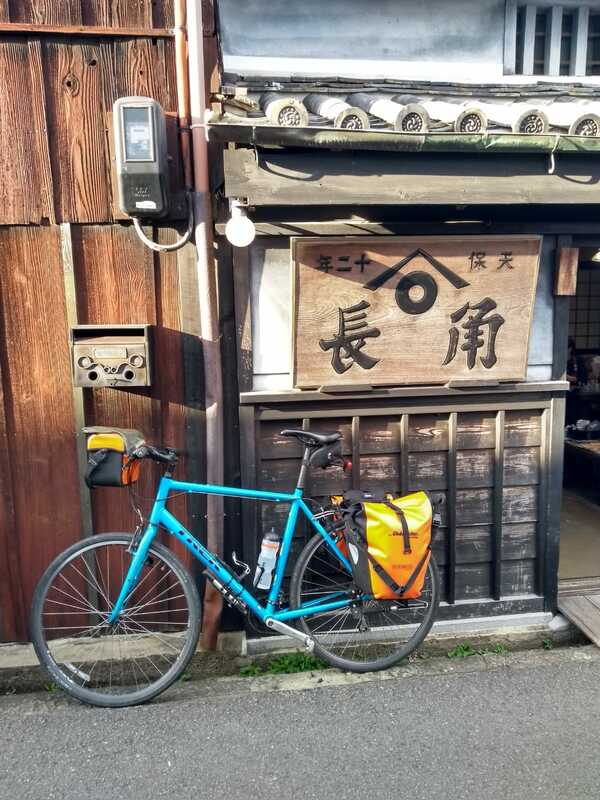 After few kilometer we end up in the small village of Hanazonokuki. For a brief moment we think it is a ghost village: no person on the road, no sign of life except for some cars parked nearby the houses. But we also see a clean swimming pool and hear in the distance the bell of some school, therefore we conclude someone must live here. Further down the road, few kilometers ahead, we cross again a small village, where we find a post office and even some hotels: this place next to the river seems to be a fishing place, and of course there are services for whoever ventures up here to enjoy their hobby. There must be also a park with dinosaurs somewhere around here, considering the boards with those beasts scattered along the road. Another few kilometers down the road we exit the highway to reach Aragi-jima: if it wasn't for the position on the map we wouldn't be able to tell that the place is the right one, since from where we take the exit it doesn't look that different from all the other spots we have seen today. 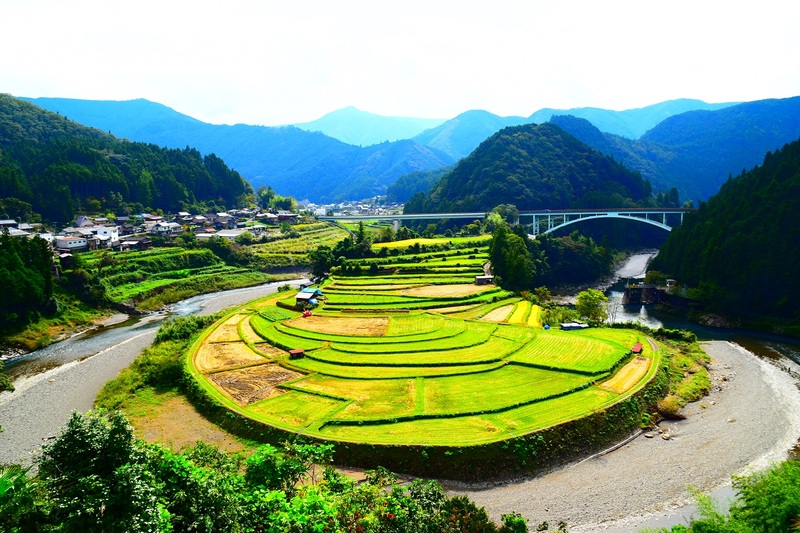 However after a short climb we reach the observation terrace from where it is possible to see the famous rice terraces. The rice has been already harvested, therefore we do not see the same golden waves we have seen around Nara and Asuka, however the view is superb. During our stay at the terrace at least three groups of tourists stop for sightseeing. They are all Japanese, and every time they are more interested in us than in the rice fields, but after hearing the details of our trip and having exclaimed the appropriate wonder, they turn back to looking the rice terrace and then leave. Having decided to stop for lunch a bit more downhill at the dam, we get back on the road following the Aridagawa. 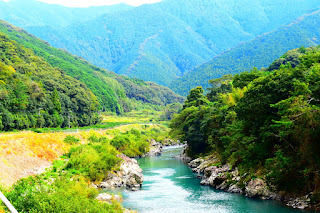 The river keeps following our wandering on the countless meanders of this highway, showing us the signs of the recent typhoon: fallen trees are clustered where the flow has deposited them during the massive rains, but that apart the views are fantastic. 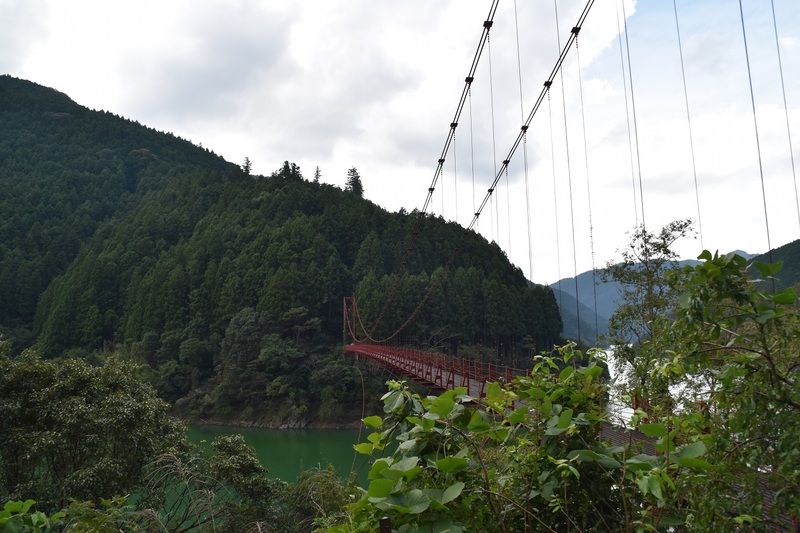 We stop to take some pictures at the red Zaobashi bridge, which should be leading to a path on the other bank of the river. 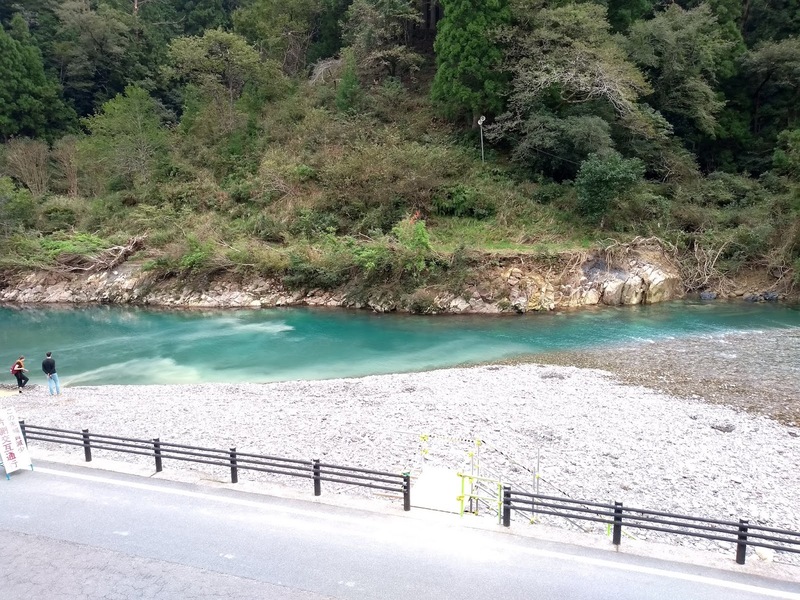 The walk seems to be too long for the time we want to put in the break, so I just venture for a while on the bridge, to better see the greenish water flowing beneath it. Then, when we reach the dam, we stop our bikes and sit down on the wall to eat our onigiri and sandwich. In the meantime an engineer comes to inspect the dam, but of course his curiosity is attracted by the two cyclists first. When we wave at him he waves back and goes back at checking the dam and the water level. We take the chance of checking the road ahead on the map: the highway will soon leave the river course and then enter Aridagawa from the North, while we are heading to the South. We find a small path that connects route 480 with route 424, and we decide that we will take it. 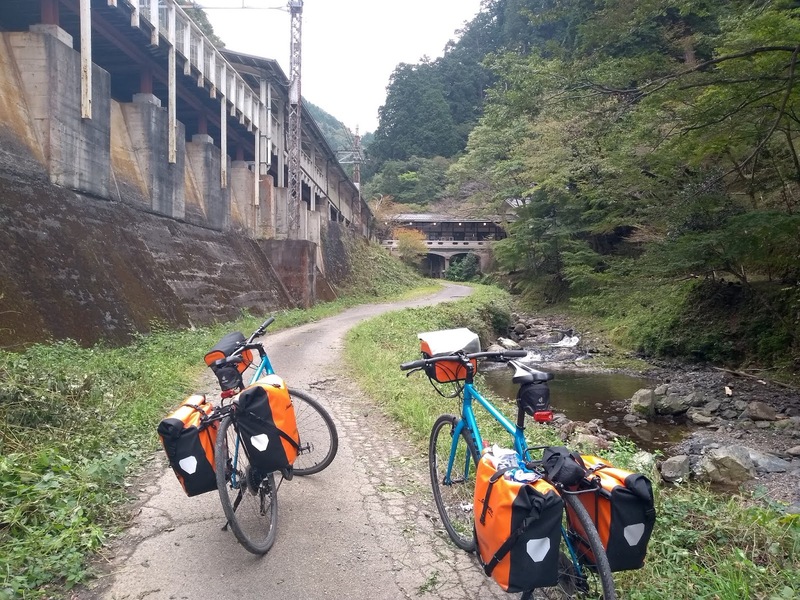 Again on the bikes, we first stop in the small village of Kawaguchi, which is small but is blessed by having public toilets and immediately out of the village we take the small road we have noticed earlier. 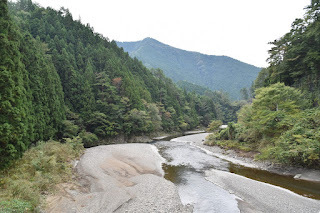 It is indeed really narrow, but it is perfect for us: only the sound of the water flowing in the river below and few birds singing on the trees accompany us, until we notice, down in the river, three fishermen who are placing the nets. We stop to watch them working and we hear their discussion while setting up the device, then we call them and wish them good luck! They are surprised and also amused by our greetings, and greet us back. The path takes us then into a small farming village, where together with small houses surrounded by rice straw we see also some larger houses clearly showing their abandoned state. 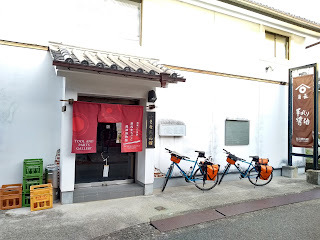 We stop to one of the houses to buy some tangerines, sold on the door, and then get on the 421 and from there on 179 entering Yuasa. Since it is still early, we decide to go directly to the soy sauce museum and factory close to the harbor. 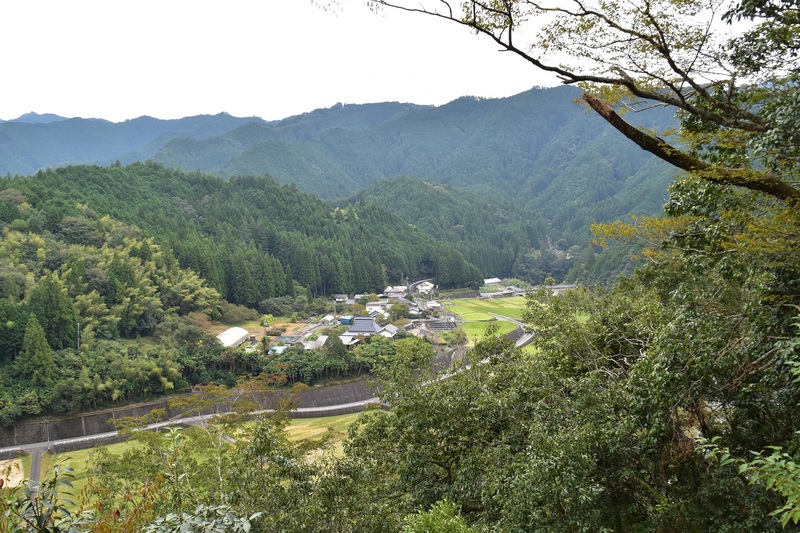 The neighborhood where they are located is extremely picturesque: old wooden buildings, the planks painted with a dark tone, line both sides of the road, and in the air the fragrance of fermenting soy beans. First we visit the museum, where we are the only visitors, and then we move to the adjacent shop. From there we move into another shop selling pottery, and when we are there an entire class of students walks by. They stop to look at the bikes parked outside, and upon seeing me getting out of the shop start asking questions. I try the best to answer with the few Japanese I know, and when their professors get close, they translate from English for the students, and take some pictures with us. Two old ladies, who have joined the party, even gift us some persimmons. 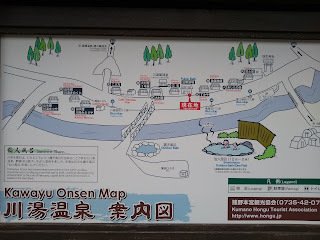 When we greet them we head to our lodging: tonight we stay at Yuasa Castle onsen, located, as the name suggests, in the former castle of Yuasa. 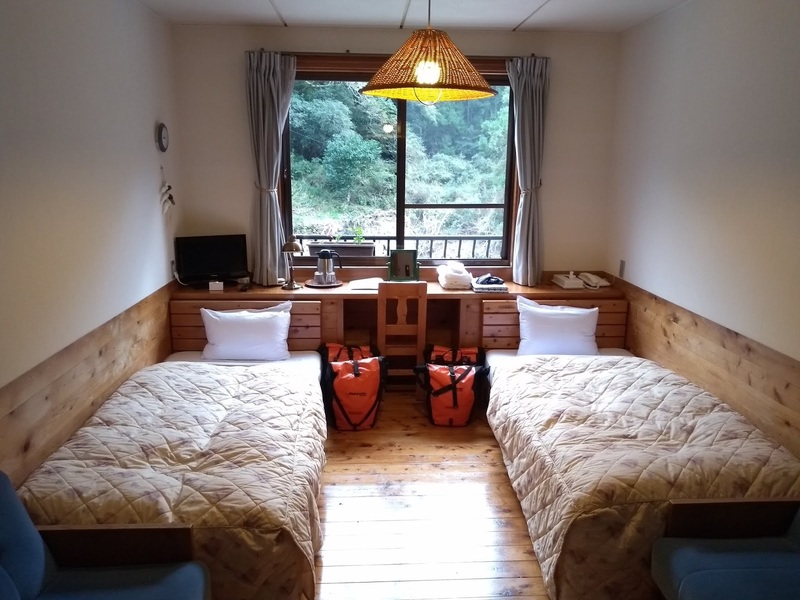 The location is fantastic and also the onsen is really enjoyable, however, after being used to the warmth of the people working at the minshukus and guesthouses we have visited so far, we notice that the quite rigid formality of the staff gives a rather cold feeling. However that doesn't spoil our day: our eyes are full of the fantastic views we have enjoyed the entire day and also of the pleasant interactions we have had with so many different people. The first light of the day wakes us up, and when we get out of the room for our breakfast the air is chilly but pleasant, the sky covered with some clouds. Today we are climbing to Koyasan, or better to the ropeway station that takes to Koyasa, and if it doesn't rain it is already good. Also the German couple gets up early with us, and we have some chat while having our breakfast, then we give a quick check to our bikes and hit the road. We first stop at the combini to buy our lunch, just to be on the safe side: we don't want to be on a road in the mountains with no food and drinks. From there we start the climb. Being early in the Sunday morning there is not so much traffic, and we can enjoy the view while the road winds on the side of the mountain. The buildings of the city quickly leave space to tall trees and sparse houses, and here and there, through the tree, we can see the railway. There are seven stations from the city to Koyasan, and we will get on board at the sixth. Along the road almost every house we see has a small table selling fruits from the local orchards, mostly persimmons or tangerines. After a steady climb we have to take a small road on the left, which goes downhill. Before proceeding further we double check that it is the correct one: we don't want to have to climb back up! But it seems to be the correct one, and we find ourselves on a narrow road, with rocks on one side and a ravine on the other, hidden among the trees. Be it right or left depends on the moment, with bridges marking the switch. 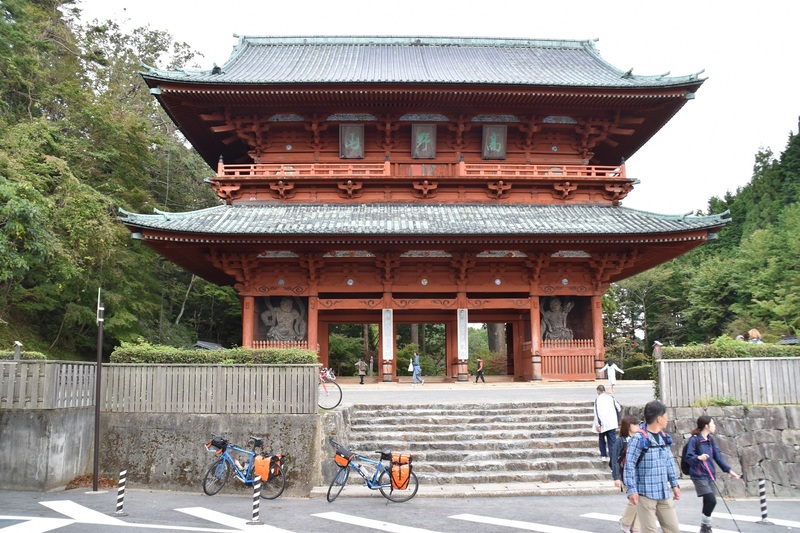 After cycling by a temple where only a barking dog welcomes us when we stop to visit it, we start again climbing up. The road here is steeper and more challenging, with no visual reference to help us guessing how far the station is, and we have to stop a couple of times to catch our breath. Then all of a sudden the view opens up and we see a concrete wall and red bridge: we have reached the station. It's not obvious the access is the one we have in front of us, but a quick inspection further down the road confirms us that there are no other means of reaching the railway. 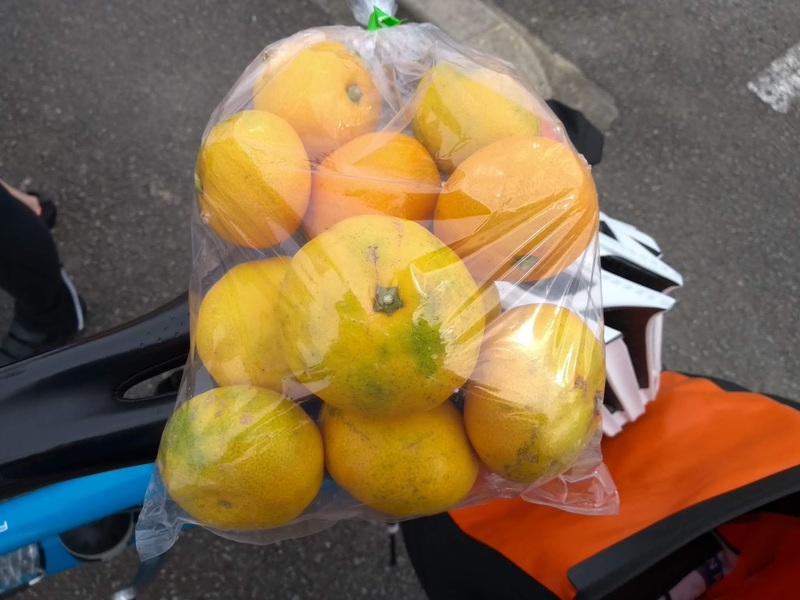 We wrap our bikes in the bags, under a sign warning us of the presence of bears in the woods, and this time we are faster than few days ago.When we are at it we see the German couple taking the rope way, and we wave at them. Then, with our bikes packed, we are allowed to enter the station and reach the platform. We enter the car and try to settle the bags to give as less annoyance as possible to the other passengers, and then enjoy the view while we climb. When we reach the top the temperature is quite lower than below, and we hurry to assemble back our bikes, searching for a spot where no tourist with large bags has to move around. Then we get on moving to warm up. In few minutes we reach the Daimon gate, and enjoy the view on the mountains below. 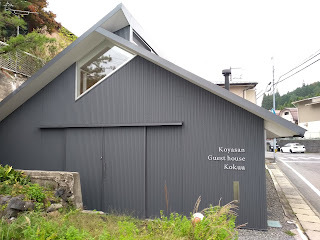 Then we cross the village to reach our destination: Koyasan Guesthouse Kokuu. There we park our bikes, take a shower and change our clothes, and before we go visiting around the nice Italian guy working at the reception explains us a bit of the surroundings. 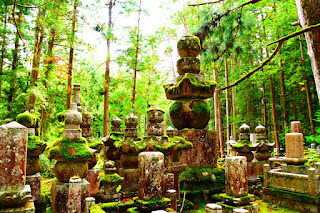 While crossing the Okunoin we still see, here and there, the damages of the recent typhoon: some trees have fallen down, crushing the tombstones all around. Probably those blocking the path have been cleaned away first, while those not obstructing the passage still wait their turn. 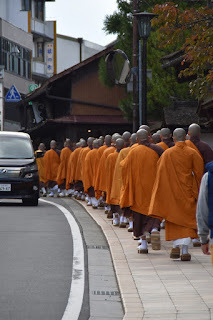 When we are walking on the streets, going from one temple to another, our path is crossed by a long line of monks, probably going to some temple. 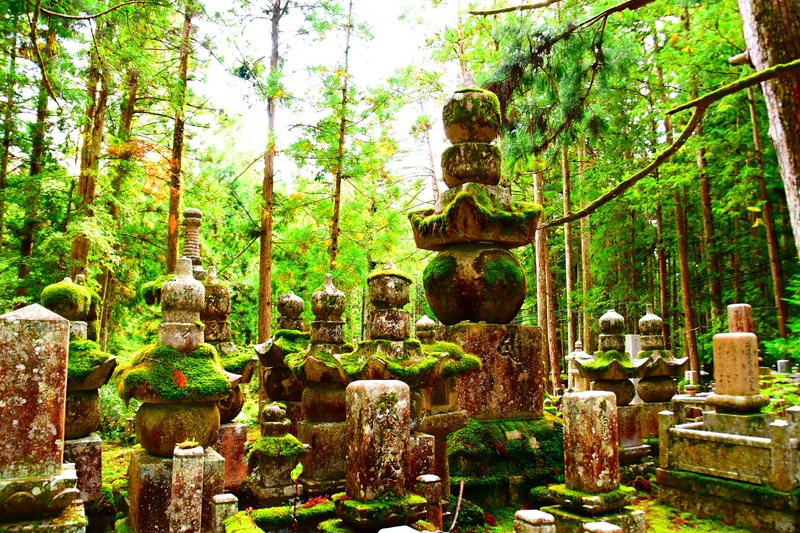 Since the sunset is close and the life of this village revolves around the temples, the roads begin to turn empty. We head back to the guesthouse, but before that we visit Kobo Daishi's tomb on the other side of the Okunoin while the lanterns on the sides get switched on. Empty of visitors the old cemetery gives a complete different feeling, and the lights scattered around in the growing darkness begin to appear like constellations in the sky. When we finally reach the guesthouse the village is already sunken into darkness. 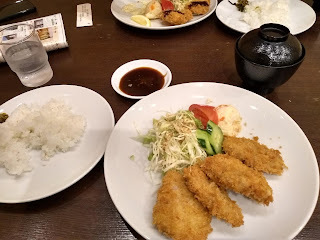 For dinner we walk to the close by Tonkatsu-tei, where the old lady welcoming the customers seems pleased that two foreigners are having dinner there. The place is small and almost empty, but after we take our sits some more diners join it. The dinner, based on tonkatsu, is really good tasting, and then get back to the guesthouse, savoring every step we take while walking back. Once at Kokuu we notice that the hall is full of people: some are having dinner, some are reading and some other are busy with tasting several varieties of sake, under the guidance of the Italian. We also take our sit and a tea and get to know two other guests: they are Belgian and they reached this far on their motorbike starting from their home. When you think your trip is special, there will always be someone ahead of you! We spend some time sitting and chatting, the cozy atmosphere of this wooden building really helping is relaxing and enjoying the company. Among the various guests stands out an Australian woman walking the Kumano Kodo, who has a really lively chat when she tells about her trip, and the time literally flies.